Anyone approaching the tiny village of Elciego in Rioja Alavesa might be forgiven for thinking they stumbled into the 22nd century. Marques de Riscal’s City of Wine dominates the timeless Rioja landscape like a futuristic fantasy. The centrepiece is Frank O Gehry’s magnificent modernist hotel, its multicoloured and multilayered sheets of titanium undulating like the skirts of a flamenco dancer. Gehry’s metal-clad masterpiece is the most astonishing building in Rioja – a region known for the ground-breaking modernism of its wineries. It’s fitting that Riscal should have chosen such a radical architect for an expansion project that began more than a decade ago: in its 150-year history it has always been the most far-sighted and pioneering of Rioja bodegas. Indeed, Marques de Riscal laid the foundations for modern Rioja. It was in 1858 that Don Guillermo Hurtado de Amézaga, Marques de Riscal, was asked by the Alava government to explore ways of persuading the local grape growers to adopt techniques then being used in the Medoc, to make the region’s wines more marketable. Amézaga already owned vineyards and a winery in Elciego but he lived in Bordeaux. There he engaged Jean Pineau, winemaker at Chateau Lanessan, who arrived in Elciego with 9000 vines of Cabernet Sauvignon, Merlot, Pinot Noir and Malbec. Pineau and Amézaga experimented with grape varieties, vinification methods and barrel regimes. They were the first to use Cabernet Sauvignon, a variety that is sometimes considered an interloper in Spain, but thanks to Marques de Riscal has a pedigree longer than Garnacha’s. The pair also introduced Bordeaux barrels, which ensured longevity, consistency and quality, and they built new cellars to house the wines. 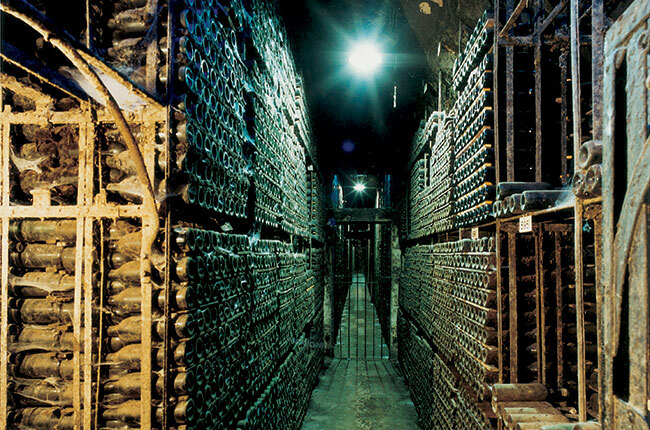 The first Marques de Riscal wines to be bottled were from the 1862 vintage, and within five years the wines began to win prizes. Within a generation the wines had achieved international acclaim, the 1895 being the first non-French wine to win the Diplome d’Honneur at the Exhibition of Bordeaux. From the very beginning, Marques de Riscal has been celebrated: King Alfonso XII of Spain discovered the wine at the Vienna Fair soon after coming to the throne, and Riscal has supplied the royal family ever since. Riscal is at the same time the oldest and the most modern winery in Rioja. Above ground, the City of Wine – with the Gehry hotel as its centrepiece – attracts 70,000 visitors a year to marvel at the extraordinary architecture. Those same visitors are also transported back in time when they visit the cellars, which hold the most complete library of wine in Spain. Affectionately known as ‘The Cathedral’, the endless cobwebbed corridors hold every vintage of Marques de Riscal from 1862 onwards. ‘This is a place of sanctity, a sacred place,’ says Alejandro Aznar, chairman of Vinos de los Herederos del Marqués de Riscal. Today, Marques de Riscal’s continuing association with Bordeaux is one of its defining characteristics. ‘We like to describe ourselves as Chateau Riscal,’ global sales manage José Luis Muguiro says. ‘We have always been identified with France and we want to continue that connection.’ Paul Pontallier, managing director of Chateau Margaux, is a long-standing advisor, to Marques de Riscal. Riscal is now concentrating on the promotion of its great terroirs through single vineyard wines. The bodega owns some 500ha of prime vineyards in and around Elciego; the estate was boosted by the 2010 acquisition of Marques de Arienzo and its 300ha of vineyards in some of the best sites in Rioja Alavesa. Having complete control over such an estate means that ‘we can focus on the plots and make terroir wine,’ Muguiro says. The single vineyard wines start with the modern-style Finca Torrea, made with 90 per cent Tempranillo from the Torrea estate, the location of the original Riscal winery. Baron Chirel was launched in 1986 using only the oldest Tempranillo and Cabernet vines, in limited quantities in only the best years, it is one of the first Vinos de Alta Expresion in Rioja. Then there is the bodega’s icon cuvée, the Frank Gehry, created in 2001 in honour of the great architect. The Gehry is 100 per cent Tempranillo, aged for 22 months in French oak. This is an ultra-exclusive wine: only one vintage has been released since its inauguration – the 2001, which went on the market in 2006. Marques de Riscal is proud of all its wines, but Baron de Chirel above all others demonstrates the bodega’s continuing association with France, the extraordinary longevity of its wines, and also its continuing focus on innovation and modernity. It is indeed an ancient winery for the 21st century.